Autumn is a great time of year. When else would you find such a riot of colors? The trees are dressed in gilded clothes. Maples drop their scarlet carved leaves. Red Rowan berries and rose hips add striking accents. All this is bathed in sunlight and framed by the blue of the sky. No wonder many artists liked to portray in their paintings this time of year. Sometimes, admiring the magnificent landscape, I want to be like them and grab a brush. How to draw a Golden autumn? Let's talk about it. 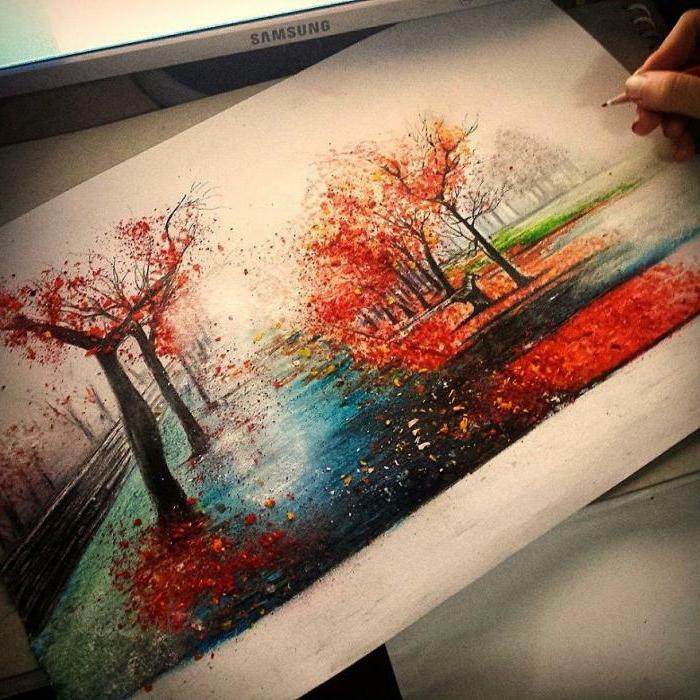 How to draw Golden autumn, so that the picture looked the most plausible? Of course, from nature. No one better than mother nature does not tell us what to take paints, how to make a song. to Find a beautiful panorama, consider it from different angles. Try to sit on the ground, to climb the hill, looking for the best view. Well, if the picture is a few plans, middleground, and background. For example, in the foreground - a colorful tree, a little further away is the river, and near the horizon a strip of woods. This will give the amount of the drawing, will make it more interesting. is not necessary to draw all the trees and stones. Highlight in the landscape is the most important thing. What elements help to convey the essence of painting? For example, an interesting play of light and shadow, the unusual combination of crimson leaves and blue sky, the feeling of a Sunny September afternoon? Not what you can do? Highlight the main subject that will attract the viewer's attention. For example, a tree or Bush. The rest is the background that shaped and beautifully complements it. How to draw a picture "Golden autumn"? 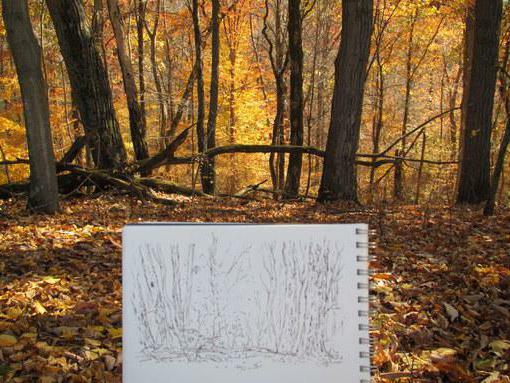 All you need to start a simple pencil and a sheet of landscape. Make a sketch, putting on paper thin lines and spots of the selected elements in the landscape. First, draws the horizon. This will help to correctly position the paper and other objects. Then the proposed configuration of land: the hills, the lowlands, the banks of a river or lake. Draw the foreground. The trunks of the trees denoted by the schematic, as well as the crown. Just sticks and branches. At desire it is possible to stroke, remembering the play of light and shadow. 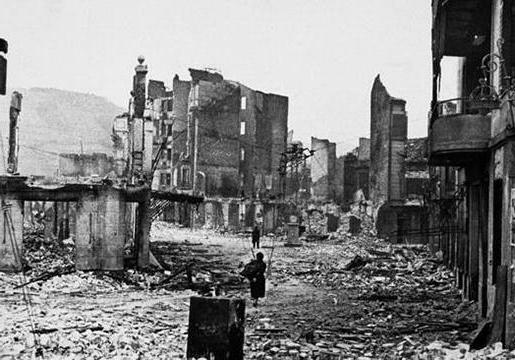 Later outlines of the objects in the distance. always keep in mind that they should decrease as you get closer to the horizon. If the picture there is a river or path, running away into the distance, mark the point to which it will be reduced, and draw two lines. Keep in mind that the artist as well as writer, has the right to the invention. You may wish to remove or add some details if it makes the song more interesting. How to draw Golden autumn pencils? With the gray color, you can draw the contours of objects, to give them the amount due to the play of light and shade. But how to reflect on the picture of a riot of colors, the transitions and combinations? One of the easiest ways - colored pencils. They are familiar to us from childhood, but do we know how to use them? In any case, recall the basic rules. the harder you press the pencil, the darker the color. To achieve the effect of airiness fairly light pressure. Really matter what strokes you are working on. So, straight lines convey direction, a wavy - like movement. Causing some lines over others, you can get a darker tone. To get new colors, apply one color to another. You can do this repeatedly. For example, first to outline the crown yellow touches, then add brown, purple and green accents. And at the end of the walk lemon across the surface. 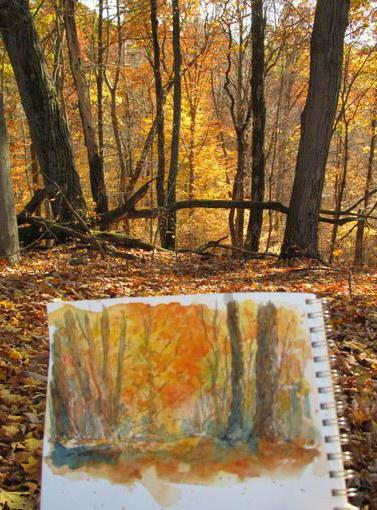 How to draw a beautiful Golden autumn colors? to Create a transparent, light-filled paintings by using watercolors. We use a technique of casting. The sheet of paper moistened with water and ink are applied to the raw base. Thus, produces a soft, blurred transitions. Sky writing, using blue and purple paints. The closer to the horizon the lighter tones. To create clouds, darkening the colors around them and slightly blurring the edges. Earth is depicted as pale brown and yellow flowers. In the foreground, the shades richer, on the back - lighter. Autumn forest is indicated by the predominantly yellow and orange colors. So far only proposed the General background, copying it from nature. Take the paint carefully, drop by drop, plentifully diluted with water. 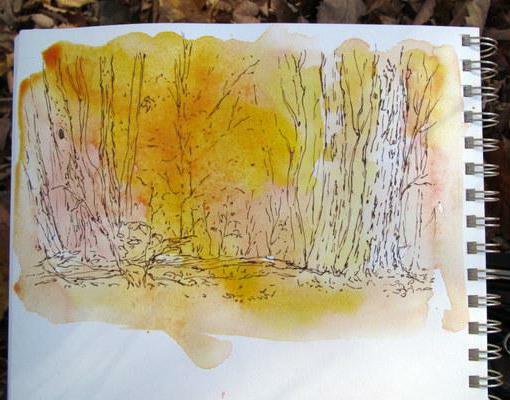 Don't be afraid to mix hues directly on the paper, in case of error they are easy to wash.
How to draw a Golden autumn in the foreground of the picture? This requires a clearer, more saturated colors. To get them, first dry the paper is coated with a background. Then start to work. Trunks of trees drawn from the bottom up. To give volume to denote shadows, mixing brown and black colors. The play of colors in the crowns can be transferred using warm, bright colors, applied with separate brush strokes. Do not forget that the trees cast a shadow on the ground. With red and Burgundy colors can liven up the woods or bushes located in the background. When all dry, a thin brush put the final touches - withered grass, thin branches, separate falling leaves. Gouache will not work to blur water or grind as watercolor, until it is completely dry. apply a thin layer. Colors can be mixed while they are still wet. First, paint is applied in the horizontal direction, and then add vertical strokes. After drying, the shade of paint may be lighter or darker. To test this point better on the palette. Start drawing from a background. And the first designated dark fragments of the landscape. Then lighter. To do this in paint mixed with white gouache. 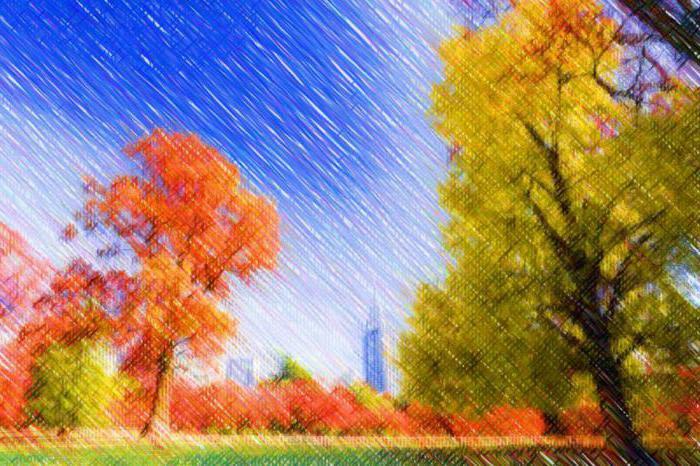 For background usually requires three primary colors: blue sky, brown earth, orange or yellow autumn forest. When the background is dry, you can deal with the details. Small strokes depicted foliage. To do this, take the orange and yellow ochre. Thin brush preconceputa trunks. The shadow pass is admixed to the main paint purple. Black color for these purposes it is better not to take - you will get dirty. At the end add the details: thin blades of grass, twigs, glare. Now you know how to draw a Golden autumn with nature. A little imagination, diligence, and the picture is ready. You can decorate her house or give friends as a gift.